Although the six artists, holding a group art exhibition called 'Triloy' at Alliance Française are young, they are full of energy, imagination, inspiration and drive. In addition, they are extremely hard working, taking the instructions of their teachers and senio rs seriously. Each of them in their own special field, be it sketching, water-colour oil painting, or sculpture, works persistently to get ahead. This tremendous zeal perhaps underlies their passion for producing some master pieces. Gentle, as are visual artists by nature, they go around explaining their entrees at the exhibition. One does not feel blasé with the experience. One does not feel, 'Why did I come to this exhibit of young ones and not to the exposition of some artist of repute?' One feels one's time extremely rewarding. One also feels amazed at the energy and enthusiasm of the passionate artists. One of the artists Rowshan Nazm Progga says, “Pen sketch is my passion. I use dots and each piece has taken about four months to be completed. Most of them feature our ancient Panam City, not very far from Dhaka. Some have been done with lines rather than dots. I concentrate on each setting for about a week. Having done the layout, I fill in the details in my spare time. I use the support of photography. But this is only towards the final stage.” The details, arches, pillars, balconies, sculpture works found in the ancient ruins have been shown with love for details. They include overgrown branches of shrubs, clinging overgrowths of trailing nature. They reflect a good study of details and ability to depict the play of light and shade. This speaks of Progga's admiration for Rembrandt. Her work in fact highlights our heritage – of which there are no patrons to do the necessary restoration work. The work with dots took four months to be completed while the one with lines took a month. Progga says that her teachers were Nisar Hussain, Farida Zaman and Jamal Ahmed. She admires artists like Micheal Angelo as well as the modern ones like Pablo Picasso. She says that she works for at least two hours on each piece. Her parents Masoom Aziz, actor and director of TV plays; and Sabiha Zaman who is also a media personality, are also very supportive. She adds that artist Rafi Haq who visits the Department of Fine Arts, DU, also encourages her. The late Said Talukdar, Rabiul Islam, Debashish Pal, Azharul Islam Chanchal have been the guides of the up and coming sculptor Sagar Chandra Das. At first he worked in the university kiln. Now that he is not a student anymore, he ventures out to places like Raibazar and Tongi to harden his clay models with fire, as other artists do. Often he has done experimental work, even though some of the works are academic pieces from his student days. One rather interesting item by Sagar Chandra Das is couples that appear as if their bodies have been pricked before the firing. The heads and endings are also intriguing. The limbs are fish-like. The figures are placed in a manner that they appear like resting seals on some beach. The bodies and details of the bodies are simplified to add a poetic and modern touch. All the pieces are hollow inside as the work is wheel-based. The time taken for each piece, says the artist, depends on the type of clay and the colour required, such as black done in high temperature. He has done his Masters from the Faculty of Fine Arts, DU like the others in the group of six. The 'kolki phul' is his own innovation, as regards the shape. Another of his pieces includes a mythological form such as a winding snake with fangs. This is based on the 'Manasha' story. Another contains an elephant's trunk and a gliding snake. This again is based on religious belief. Yet another item contains a snake and a flower. Both are hollow creations. One award-winning item containing the figure of an elephant includes flowers for decorative effect. The eyes and trunk may be traced out. Again, the rich, decorative figure of 'Ganesha' is found in a glazed item, which has added appeal due to the presentation and finish. Nayan Kumar Adhikari has painted scenes from the Art College, and still life with bright, inviting flowers, placed in a container, a vase etc. He goes in for water colours as he creates best in this medium, apart from oils. To finish each entrée took him from four days to a month, depending on the medium. It's oil, which he likes best to work with, like most painters. His teachers include Sheikh Afzal, Nisar Husain and Farida Zaman. “It's because our teachers guide us with care and affection that we can go ahead so rapidly and easily,” says Adhikari. Talking about famous artists of the past, who have inspired him, he says that he enjoys realistic work, such as the ones by Renaissance painters, especially Raphael, Titian and Leonardo De Vinci. The life and work of Mexican artist Frida Kahlo also drove him on. Hailing from Daudkandi, Comilla, he says that it's his widowed mother who encourages him in his work. He says his monetary needs, as regards buying painting materials, are met with his earning from tuitions. 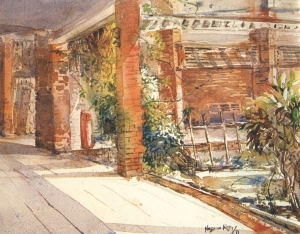 Najmun Nehar Rosy has pillars, fountains, trees and other picturesque setting of the Art College presented in her neat canvases. Najmun Nehar has restricted her subjects, as she is in the Print-making section. She says she has professors like Rokeya Sultana, and Abul Barq Alvi as her constant guides. 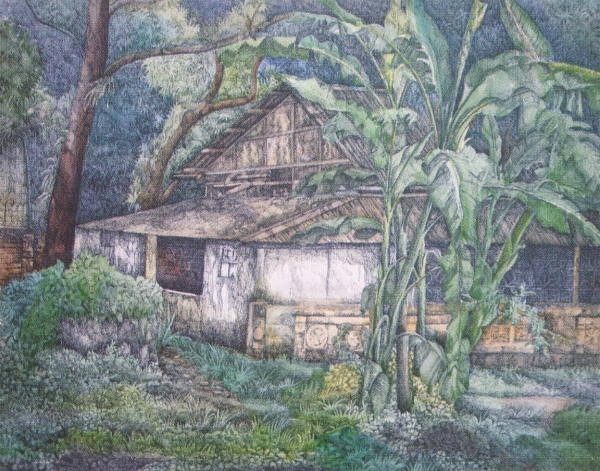 The other artists, such as Chayan Kumar Das, have also put in interesting items like 'Alone'– a dry point print.